You’ve heard your friends sing the praises of Agile. Your project manager buddies are becoming scrum masters. You hear how great it is. All the cool kids are doing it and you’re a bit jealous. You’re feeling left out. You want to see what all the fuss is about. Good news – there are Agile practices you can use even in your waterfall world. You’ll get the benefits of increased communication, customer collaboration and continuous improvement. And you’ll get a chance to introduce some Agile practices to your team. Without having to transition the whole organization to full-on Agile. Don’t adopt Agile practices simply to follow the crowd. Understand the benefits you’ll get from incorporating Agile practices. You’ll save time and money by getting customer feedback and delivering the right product. You’ll work smarter through increased communication across the team and improved working practices. Talk with your team and get their buy-in. The change will be a team effort, and you’ll need their collaboration and cooperation. The whole team needs to be on board. You can’t do this alone. Share your ideas with the team and why you want to do it. Find out your teammates’ thoughts and concerns. Make sure they’re open to giving it a try. You’ll need to approach this with their support, because they’ll be playing along, too. The benefit: Increased transparency and increased communication among the team. Your team will have greater insight into progress and challenges. The project manager can “lead” if needed, but Agile teams are self-organizing and can do this even if the project manager can’t be there. How to do it: This is a very short meeting (15 minutes or less) that gives the team an opportunity each day to touch base and share information. • Do you have any roadblocks keeping you from doing your job? In traditional Scrum/Agile the scrum master works to remove roadblocks, but the project manager can do that, too. Warning: This is NOT a 30-minute status meeting. It’s not a long discussion of details. Rather, it should be very short – 15 minutes or less. It’s a touch-point for your team every day to level set. If the team needs to discuss more detail, do it after the stand-up. A friend of mine suggested to his boss that they try this out. They were having very long status meetings. His boss agreed and loved the idea. But instead of the team members having a quick daily meeting, his boss runs it. 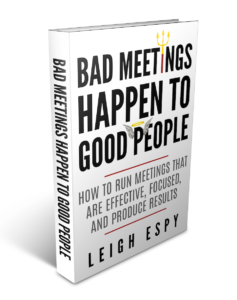 Worse yet, it’s turned into an extended status meeting every single day – a worse situation than before. Avoid the temptation to drag it out – stay on point and keep long conversations for after the stand-up. Your team will identify ways to improve during the project, rather than waiting until the project is over. You’ll gain the benefits of continuous improvement through the course of the project. How to do it: At various points during the project, the team assesses how they’re performing. • What worked well for us? • What can we do differently to improve? Choose various points during the project to use this Agile practice. Once you’ve done the exercise and identified things you can improve, pick one or two you’ll target first. Incorporate those changes and see how it goes. Then repeat this process at various points throughout the project. Your team can incorporate improvements while the project is still underway, rather than waiting until the project is over. Note: There needs to be an environment of trust and support among team members. Don’t criticize others for suggestions they make. Don’t blame team members for faults, but rather identify ways to improve. Be open to hearing the challenges as opportunities. The benefit: transparency and customer collaboration. The customer benefits by seeing the product so far and giving feedback. The team gets the advantage of customer feedback for any necessary adjustments. How to do it: Show working software to the customer at appropriate points throughout development. Don’t only wait until it’s ready for end user acceptance testing. This is NOT a PowerPoint presentation. You’re showing the actual software. Don’t worry about this being flashy and slick. Your goal is to show the customer how the product is progressing and to get feedback. You don’t have to rent a huge conference room and make flashy powerpoints. You’re not showing a finished product at this point. Manage customer expectations about what you’re showing. You don’t want to surprise them if they expected something else. Make sure they’re aware that this is early and not the end product. Explain why you’re doing it and what you hope to gain. Adopt the spirit of collaboration, communication, and continuous improvement. Do it with respect for all your team members as you adopt new practices. And be patient with one another. You won’t get it perfect right away. But you’ll benefit and probably enjoy it, too. 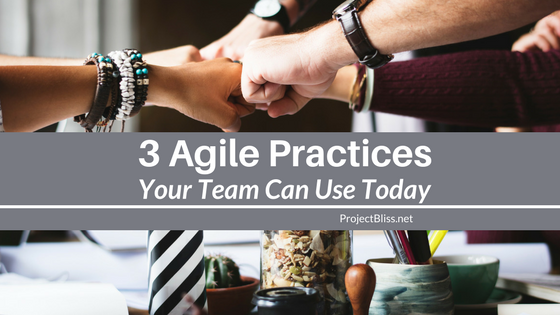 Now that we’ve been through the 3 Agile practices, you can hopefully see how to use these even if you’re not going full-on Agile. There’s no reason to feel left out anymore. Next time your scrum master friends are talking Agile, you can join right in. Tell them the ways your team has improved and how happy your customers are. And those other friends who haven’t tried it yet – share the love by sharing this information with them! I’ve made you a handy guide to get you started. Download this printout for your team to use as you begin to adopt these practices. And let me know in the comments which practice you decide to use first – or if you’ve already adopted any, tell us about it!